We have tomatoes for everybody! Huzzah! Long Wind Farm grows their delicious tomatoes in a cluster of greenhouses along the Connecticut River in East Thetford, Vermont, with the ripest tomatoes harvested every single week. They'll be growing like this until December, when it's no longer cost-effective to heat the greenhouses to the required toasty temps. We're also really excited to send along Cranberry Apple Cider from Champlain Orchards in Shoreham. The tasty, tangy treat is actually a collaboration with the Vermont Cranberry Company, who sends their cranberry juice from Fairfax down to the orchard where it's mixed with freshly pressed apples and bottled. What a sweetly Vermont product! It's finally starting to feel a little bit like spring (can't wait until those April showers bring some May flowers). Springtime means one big thing for us over here at the Intervale Food Hub: preparing for summer. While we still have a couple months left of our current season, we can't wait to start delivering the best baskets of the year to your home, workplace, or community center. Never signed up for summer before? Check out our useful summer details page where you can see a list of produce that we deliver to you throughout the warmest months of the year. Our summer sign-ups are now live, and quite a few things are going to change with the new season! We've switched over to a new, simpler ordering system which will make your weekly process much easier (it even remembers your payment method!). However, this switch does require you to create a new account;although it is simple and speedy, we would gladly do it for you over the phone. We've changed monthly subscriptions to recurring weekly subscriptions, with tons of new offerings. If you received salmon or bean burgers once a month, you can now receive those items each week. Carb fanatic? We'll toss an extra loaf or two from Red Hen into your weekly delivery. Die-hard smoothie drinker? Add a bag of frozen strawberries or blueberries from Adam's Berry Farm to your subscription and receive it every single week, no hassle. Our Pop-Up Shop has been redubbed "Add-Ons" for obvious reasons, but the concept is the same. If you're expecting company or just a little hungrier than normal, you can add any of the items in our store to your delivery. Pretty flexible! If you're ready to sign up, we would be thrilled! Your advanced subscription gives farmers a huge amount of security in an precarious industry. When you sign up today, a vegetable farmer can sow a crop with a settled mind, knowing the food they're growing will not go to waste come harvest time. When you continue your subscription with us, a fruit farmer can invest in a new disease-resistant apple tree, knowing that there are folks who will support their farm through the years that the tree slowly matures without bearing fruit. When you choose the Intervale Food Hub, a beef farmer is able to focus on the welfare of their animals instead of focusing on marketing and selling their products. Vermont's farmers need your support. They're a huge part of what makes our state so unique, beautiful, and tight-knit. When you subscribe to the Intervale Food Hub, you support over 40 of those farmers throughout an entire season. Your membership is vital to revolutionizing our food system and keeping Vermont's farmers afloat. Can they count on you this year? Receive a free Intervale Food Hub tote bag with your next delivery when you sign up for summer. 100% cotton and locally printed at New Duds in Winooski. Tomatoes: Store at room temperature on your counter, avoiding direct sunlight. Eat within 2-3 days. Shallots: Store just like onions. Shallots will only last approximately 2 months, but if they sprout, use the sprouts just like chives; the rest is perfectly edible, too. Onions: Store unwashed in a ventilated paper bag (like the ones they come in) or a cardboard box in dark, dry, cool place, such as kitchen cabinet or basement. Eat within two to four weeks (humidity dependent) or, if desired, wrap in newspaper and place in a cardboard box before storing in pantry or basement. Similarly, sprouted onions are perfectly safe to eat if they are still firm and free of mold. They may have a slightly bitter taste if sprouted, but the bitterness will mellow if onions are cooked. Onions will also last approximately 6 months, humidity dependent. Potatoes: Store unwashed in a ventilated paper bag (like the ones they come in) or a cardboard box in dark, dry, cool place, such as kitchen cabinet or basement. Eat within two to four weeks (humidity dependent) or, if desired, wrap in newspaper and place in a cardboard box before storing in pantry or basement. Potatoes will last approximately 6 months if stored in this manner. If potatoes start to sprout, but are still firm, they are perfectly safe to eat. If they sprout and get soft, it's best to compost them or cut them up with an eye on each piece, let harden, and plant! Rutabagas: Quite the opposite of potatoes and onions, rutabagas store best in relatively high humidity, though they still require cool, dark conditions. Store rutabagas in the refrigerator for optimal temperature and humidity conditions, and eat within a few months. Do not wash before storing. Happy third week of delivery! We have some awesome collard greens from Miskell's in Charlotte, we've got more of those super delicious Shiitakes from 1000 Stone Farm in Brookfield, and we have some radical purple potatoes from Burnt Rock Farm in Huntington (make some bread, we dare you). Yes, we do still have carrots, and we know you might be a little bogged down in them, which is why we've included links to some of our favorite carrot recipes at the very bottom of this email! And, just a reminder that you still have time to add on anything your heart desires from our Pop-Up Shop to receive it in this week's delivery. Big thanks if you've filled out our survey! We really want to understand your eating, cooking, and food shopping habits so that we can tweak our services to fit your lifestyle. If you want to share it with friends, you can do so by following this link and sending it around, as it's open to everyone who lives in Vermont. And if you take it, you're entered to win $50 worth of food from our pop-up shop! Microgreens: Keep in package and store in refrigerator. Eat within 2-3 days for best texture and flavor. Shiitake Mushrooms: Transfer to paper bag (or wrap in dry paper towel and put in open plastic bag) and store in refrigerator. Eat within 1 week, or slice thin and dehydrate on sheet pan in lowest-heat oven for approximately two hours, flipping and blotting moisture halfway through. Sauteed mushrooms will keep very well in the freezer for 2 months. Collard Greens: Keep these unwashed in a damp tea towel and in an open container in the crisper drawer. Not enough fridge space? Trim the ends slightly and store upright in a large jar of water on your counter. 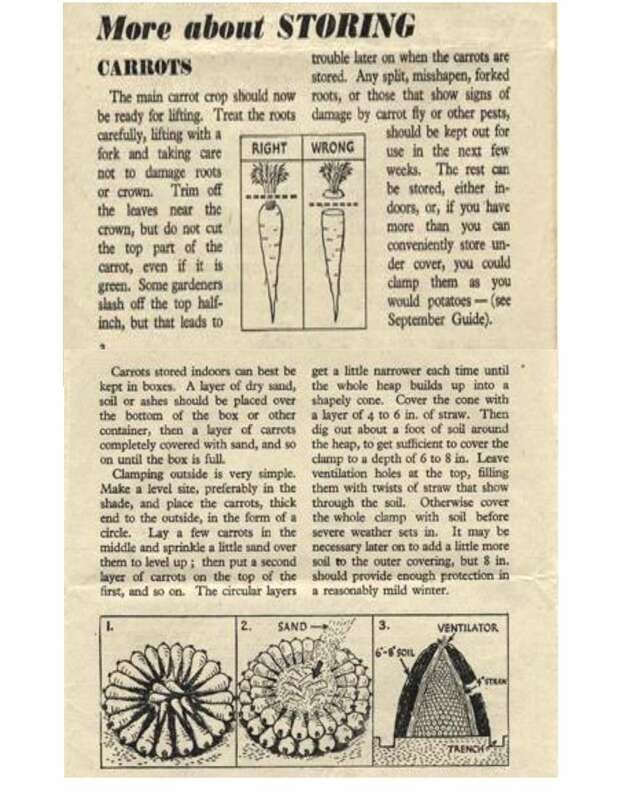 Carrots: Place in container and cover in water with lid. Change water every 4 days. Eat within 1 month. Bags can be reused: if you'd rather reuse plastic bags, bring them on your next grocery shopping trip for use in the bulk section. If you keep a handful of small clean bags in your reusable grocery bag, it will make them easier to remember. (Reminder that basically any container can be used for bulk shopping at most grocery stores, as long as you weigh the container before filling!) And on a different note, instead of purchasing small trash bags or pet waste bags, use the bags you have on hand. Reusing = reducing. Food stores great without plastic bags: There are a lot of alternatives to plastic bags for food storage, mainly reusable containers and tea towels. Berkeley Farmer's Market has an excellent guide to storing your produce without using plastic bags. You can see it here. Okay - we know - we are sending you a LOT of carrots. And we promise we're on the cusp of getting new veggies in your basket! But for now, we've collected a handful of awesome recipes to make sure you can blast through this week's supply (and anything you may have stocked up on). Here you are! Hope you're not too sleepy from today's darker start, thanks to daylight saving time and some heavy clouds overhead. Never fear - we are bringing the light of spring to you via fresh, tender bok choi, some super tasty & golden polenta loaves, and teeny tiny tender baby spinach! Read on for all the news! P.S. Check out Health Hero Farm's awesome blog to learn more about their humane certified grass-fed beef! Also: rutabagas are called neeps in the UK! How fun. Buckwheat Shoots: Keep in package and store in refrigerator. Eat within 2-3 days for best texture and flavor. Bok Choi: Keep in plastic bag or wrap loosely with tea towel and store in crisper section of refrigerator. Eat within 1 week, or loosely chop and place in freezer bag (with all air removed), storing in freezer for up to 4 months (do not wash beforehand). Sweet Potatoes: Store unwashed in dark, dry, cool place, such as kitchen cabinet or basement. Eat within two weeks or, if desired, wrap in newspaper and place in a cardboard box before storing in pantry or basement. Sweet potatoes will last approximately 6 months if stored in this manner. We have great news for you! Our awesome intern Caroline has created a cooking instructional for this week's recipe. Check out the rustic beef stew video below and click on the link for the full recipe. This week, you'll be receiving your first delivery of the Spring Season at the Intervale Food Hub! We have a lot of different kind of foods for you with pretty varied storage lives, so we've made it easy: this week's veggies are listed in order from what you should eat first to what you can take your time on. We've also included storage tips to make sure nothing goes to waste and that all of your share ends up eaten at its peak freshness. Sounds good? Great. If you're interested in cooking our recommended recipes, scroll on down to the bottom of the page and click the link to be brought to simple, straightforward meals that will leave you satisfied. We even have cooking instructional videos for those of you who'd rather watch than read! We have great news for you! Our awesome interns (Madison, Caroline, and Sophie) have created an awesome cooking instructional for this week's recipe. We are here to help you through the week ahead! For breakfast and a quick snack, make healthy, delicious apple carrot muffins, or skip straight to a dinner of steak with mushroom gravy and mashed parsnips and potatoes on the side. YUM. This week is gonna be GREAT! You know why? One: there's sunshine in the forecast every single day! Two: our delivery this week is deee-licious. Taste the rainbow with a slew of rainbow carrots from Riverberry Farm. Embrace the season and make borscht with the REDDEST beets from Pitchfork Farm. Go wild with green cabbage from Intervale Community Farm (we're talking kimchi! sauerkraut! ferments!) Bring it all home with some cozy butternut squash from ICF and top it all off with a sprinkle of microgreens. We know you haven't been living under a rock. But in case you're a Grade A email skimmer, our spring subscription starts in 2 weeks and we'd love if you stayed with us. Use code PARSNIP2019 to waive your $25 sign-up fee, as you're a returning member! Let's go! This week, we're focusing on keeping things toasty. Because, while it will be a gloriously sun-filled week, we all know that normally means a chill to the air this time of year. So throw an apron on over your long-johns and dance around the kitchen in your slippers, because you're going to love these recipes. Head over to our website to get started on a rich vegetarian soup or crunchy root veggie latkes. 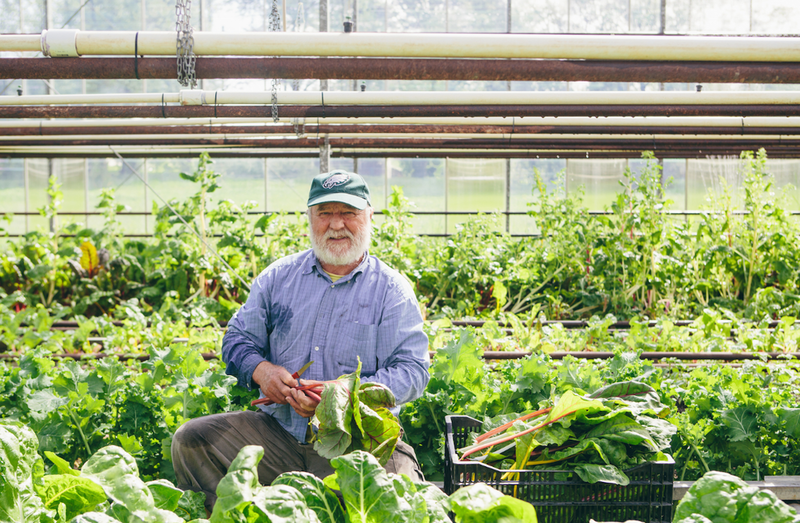 Meet Dave Miskell, who grows great produce year-round in his Charlotte greenhouse! We have an awesome mix of food for you this week. For starters, we've got sweet potatoes, which can be eaten for breakfast, lunch, dinner, AND dessert, no matter which meal you consider the most important of the day. These taters come from the Burnt Rock Farm, as do the delicious yellow onions in this week's share. (Getting kind of sick of onions? Check out this amazing infographic that outlines every possible way to cook this feisty bulb, including sweating and pickling.) We've also got buckwheat shoots grown right here at Pitchfork Farm, fava bean shoots from Queen City, and a *forest medley* of mushrooms (oooo how mysterious). We hope you have fun with your food this week! Ready for spring? Us too! Our spring subscription starts in 3 weeks and is bound to be tasty. If you sign up on or before this Saturday (Feb 16), you'll receive a token for a free pizza from American Flatbread's Burlington Hearth. Delicious deal. Plus, use code PARSNIP2019 to waive your $25 sign-up fee, as you're a returning member! Let's go! Justin Rich, co-owner of Burnt Rock Farm, harvesting sweet potatoes. This week, we're bringing Alaska's bounty to your kitchen. For those pescatarians and omnivores among us, we've created a simple Asian-inspired stir-fry that highlights the rich flavors of Starbird Fish's salmon. If that doesn't float your boat, try these 5 easy methods of cooking this filling fish. We also have your breakfast covered with a sweet potato hash recipe that pairs great with your Localvore half-dozen eggs. If you're storing your sweet potatoes, make sure you skip the fridge; they last longest in a cool, dry, dark location, like a kitchen cabinet or pantry. If you prefer your eggs with a runny yolk, try out this foolproof method of poaching or soft boiling eggs - we've tried both methods countless times and they have yet to let us down! We are so excited to share this week's food with you! Both of our root veggie offerings were grown right here at the Intervale and add rich color and nutrition to your plate this week. Yellow onions and Enterprise apples are versatile additions that can bring sweetness and complexity to any dish and, while they're fine on the counter, store much better in the fridge. This week's shiitake mushrooms are delicious and packed with rich, earthy umami flavors that deepen when sauteed, and pair very well with bok choy, a vibrant Chinese cabbage. Ready to cook? Scroll down for our suggested recipes! Interested in continuing your subscription into the spring (and beyond)? Our spring subscription sign-up page is now live and we would love to keep bringing you that good good food each week. Sign up here. Interested in a summer subscription, too? Follow this link and you'll be the first to know when those sign-ups go live. 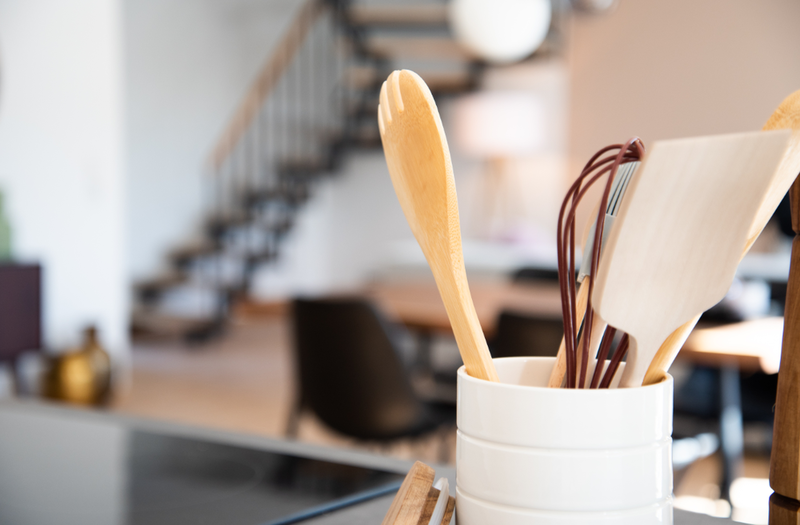 Looking to flex those new cooking muscles? Enter the Wintervale's Chili Cook-off for a chance to receive a delicious goodie basket from City Market. Email abby@intervale.org before February 5 (tomorrow) to save your spot for the cook-off on Feb 24. Want to kiss the winter blues goodbye? Us too. We're kicking out the cold and bringing the backyard barbecue indoors with this week's recipe collection. Tangy BBQ drumsticks will have you remembering picnics by the lake and sunshine on your shoulders. Bring some greens to your plate with a bok choy and mushroom stir-fry, and finish off your meal with a roasted beet and apple slaw that tastes even better the next day. And may we recommend this deliciously simple apple crisp recipe for a cozy dessert? Your belly will thank you later. Struggling with how to cook turnips? Turnips taste great chopped and roasted alongside other vegetables! You can also boil and mash them as a great alternative to classic mashed potatoes. Check out the color in the Burnt Rock Farm pack house! Owners Justin Rich and Lindsay Lyman-Clarke and their crew prepare for their Winter CSA pick-up in Huntington, VT. We’re lucky to have such an abundance of flavor and color in our winter diets here in Vermont. Not only are squash one of the oldest crops in cultivated history, dating back 10,000 years to their origin in Mesoamerica, but they are often miscategorized as vegetables. Squash are actually fruits! Sweet & Sour Roasted Napa Wedges (MyRecipes): This recipe makes preparing the napa easy! Just chop, season, and roast! Fingerling Potatoes with Oyster Mushrooms (Epicurious): In this recipe, substitute the fingerling potatoes for chopped red potatoes and voila! Yum! 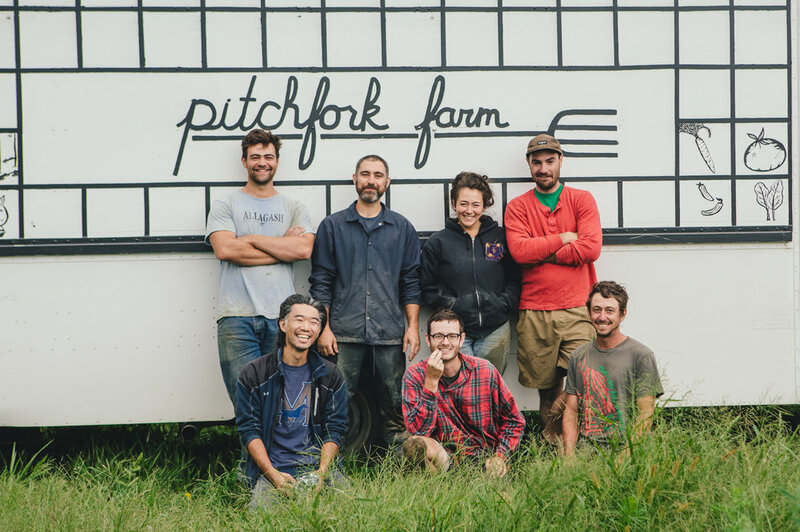 If you aren’t already familiar, meet Pitchfork Farm & Pickle! Eric Seitz and Rob Rock, owners of Pitchfork Farm, have recently opened up a new operation in Burlington’s South End! In their new space in the Soda Plant on Pine St., they grow a variety of microgreens (including the delicious sunflower shoots in this week’s share) and have added various ferments to their repertoire! Check out their Instagram for new and exciting updates! Sunflower Shoots are a nutrient powerhouse - eat them ASAP for the best flavor and texture! With the nutty flavor of sunflower seeds, they add a nice leafy crunch and nuttiness to any dish. Meet Intervale Community Farm! Pictured above is Aly Martelle, who has been working at Intervale Community Farm since 2007. Intervale Community Farm is located right down the road from the Intervale Center & Intervale Food Hub! This certified organic farm has been in operation for more than 30 years. They operate a unique on-farm CSA experience that’s know for it’s pick-your-own features. They have developed techniques and infrastructure that allow them to grow local food in all 4 of Vermont’s wild seasons. We deliver a range of organic produce to our members that’s grown right here in Burlington - and often it’s delivered to the Intervale Food Hub by tractor! This week, our organic red cabbage comes from the Intervale Community Farm. Enjoy! Watermelon Radishes! Under their pale green skin is a bright pink center. They’re really delicious for a crisp snack in hummus or dip! Or, pickle them for an extra crisp and crunchy snack. Pea Shoots in the variety packages are a nutrient powerhouse - eat them ASAP for the best flavor and texture! Pickled Watermelon Radishes recipe by Food52 (one of our favorite sources for recipes!) This is an easy pickled radish recipe that uses only a few other ingredients that you likely already have at home! Pickled radishes will add an interesting and delicious acidic flavor to your meal. Beet, Apple & Red Cabbage Salad with Feta recipe from Rhodes: This Beet, Apple & Red Cabbage Salad with Feta recipe is a combination that we love! The recipe we found might need a few adjustments to fit what you have on hand. Try out your own version! Beet and Cabbage Sauerkraut from Feasting at Home: Want to try making your own fermented vegetables? Try this vibrant purple version of sauerkraut, made with red beets and red cabbage. 15-minute Stir Fried Steak Tacos from The Food Network: Beef Top Round, also known as stir fry steak, is great because it cooks quickly at high heat over a short amount of time. Use the beef top round in place of the skirt steak in this Food Network beef taco recipe! We suggest the watermelon radish, red onion, red cabbage, and feta from this week's share as possible toppings, and you can put it all in the All Souls corn tortillas. If you like, a salsa verde would also add some more flavor and spice to your taco. Meet Vermont Bean Crafters! Vermont Bean Crafters is a group of friends committed to bringing local and organic fare to their community. All of their products are at least 90% locally grown and organic by weight, and the only distantly-sourced ingredients they use are salt and spices. You can even see their Farm Sources page for a list of their ingredients and where they're grown. Vermont Bean Crafters’ burgers and other items are all Gluten-Free, Plant-based and Vegan, GMO-free, and made in the Mad River Food Hub's Nut-Free facility. They provide a seasonally-fluctuating menu of bean and vegetable burger varieties, as well as a myriad of week-to-week market-fresh concoctions available exclusively at farmer's markets, and special events. This week, they’ve also packed up some delicious white beans for our Omnivore and Localvore Packages as well. Eat this first: Parsley & Fresh Herbs - fresh herbs can build delicious flavor for just about any dish. If you don’t have plans to use them right away, you can easily preserve them! Use our recipe for herb & oil cubes below. Baby Braising Greens - these tender greens are a real treat for our Variety Size Packages now that winter’s here! Eat these soon for the best quality, flavor, and nutrition. Meet Cranberry Bob! Bob Lesnikoski, of Vermont Cranberry Company, has been growing cranberries in Fletcher, Vermont since 1996. The farm grows about three acres of cranberries in constructed bogs. Bob happens to be a fisherman and mushroom forager as well! Vermont Cranberry Co. cranberries are grown using sustainable and ecological methods. Eat this first: Braising Greens Mix. Try a simple saute with butter and garlic! Not in charge of cranberry sauce this year? Try Cranberry-Pear Crisp or homemade Cranberry Muffins with Walnut Crumb Topping! Thanksgiving Classics - Two Ways! Brussels Sprouts: If your stovetop and oven will be full, try making slow-cooker Brussels sprouts! The vinegar will thicken during cooking for a delicious glaze. Or, if you have room in the oven, try roasting your Brussels sprouts, and build flavor with toasted nuts and a pungent local Vermont blue cheese! Cranberry Sauce: You can stick with a very Vermont version, with apple cider and maple syrup added for sweetness, to balance the tart flavor of these fresh cranberries. Or, you can add in spices and citrus - with orange, ginger, and clove, for a more exotic addition to your Thanksgiving table! Stuffing: Whether you’re starting with a stuffing mix or a fresh loaf of bread, you can build flavor in many different ways. Try a rich and savory chestnut and sausage stuffing for a hearty, filling side. Or, build vegetarian-friendly flavor with mushrooms for umami and celeriac for a light celery flavor that’s seasonally appropriate. Meet the Diggers! Diggers’ Mirth Collective Farm is one of the certified organic farms located in Burlington’s Intervale… just down the road from the Intervale Food Hub and the Intervale Center! The Diggers have a unique cooperative model with a focus on local food access. You can find their Veggie Truck driving around the Old North End on warm summer evenings! In the picture above, the crew is harvesting mesclun mix on a late summer day. This week’s mesculn delivery will be our last delivery of a veggie harvested from an outdoor field until spring. 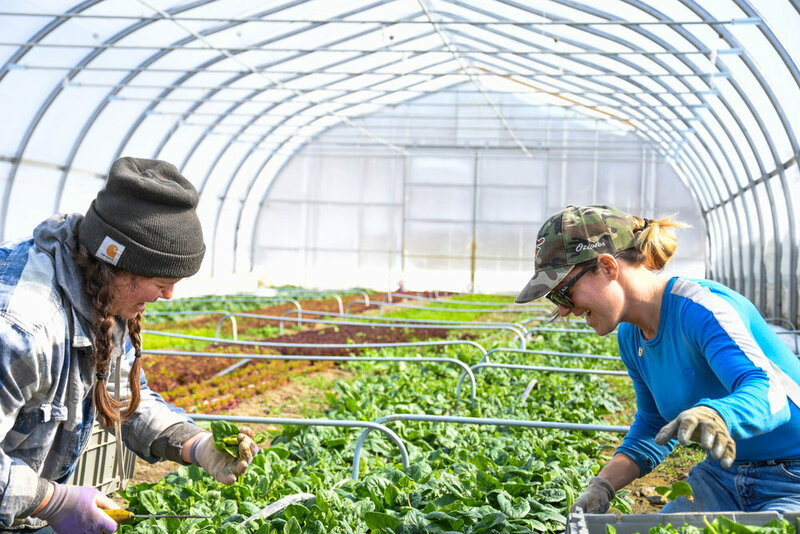 We’ll deliver greens that are grown in hoop houses and greenhouses during our colder seasons. Monthly Subscriptions Delivered This Week! This will be the final delivery of Monthly Subscriptions for the Fall/Winter season. Eat this first: Mesclun (for members with the Variety Package) This flavorful green will make a delicious quick salad! Try adding some roasted squash to your salad! And, napa cabbage and mushrooms. Napa cabbage has a nice tender texture that makes it much easier to use and quicker to cook down that a standard green cabbage. Mushrooms will have the best flavor and texture if you use them up quickly! Meet 1000 Stone Farm! Our new partners for delicious, Vermont-grown, and certified organic mushrooms. 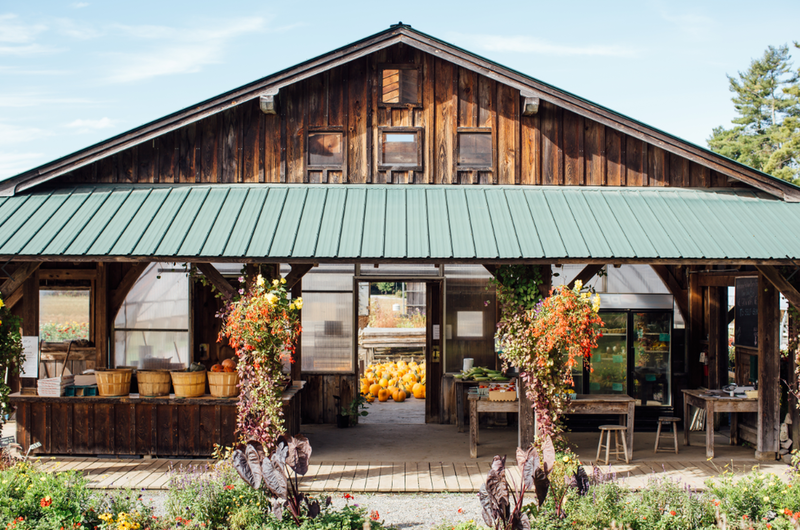 This small fruit and vegetable farm is located in the rocky, rolling hills of Brookfield, VT (near our pals at Fat Toad Farm!) We’re so happy we’ve found another great small family farm in Vermont to share with you. Mushrooms add a really nice variety to our Vermont Vegetable packages throughout the year. Enjoy!